As you may have known, TTPS Northen Division stopped the D&W event on the 12th of January. Since then we have been trying to find out what is needed to continue having events. So far there are requirements which we are told is law, but we cannot find, nor have been told where to find said law. As such, we are booked for this sunday at ARC, and we will see how the day unfolds. So the details, with some changes. There is no gate charge. However as tenants of a rented space CARS reserves the right to refuse admission. CARS Autocross is holding the first family day / training BYCC for 2014 on Sunday 2nd February at ARC Santa Rosa. The day’s activities include Driving school, open practice, timed runs, and maybe the old head to head format. These charges are as usual to offset the rental from ARC and other operating costs. Alternatively requests can be sent to carstt@gmail.com and bookings made no later than Thursday 30th January . So this is very similar to TTASA Family day event held in the Car Park of L.G. Stadium on 26th January, where NO police was also "in attendance". Car park events also do not require Roll Cages as clearly stated to Devi and Shalan by Nizam Mohammed of TTASA. Yuh good to go, unless the badman come up with a new condition! ^^Agreed...I will be there on Sunday hoping for a great day of practice and helping wherever I can! This organisation has my full support. This time ah coming with meh lawyer friend. MICROTECH 7 wrote: This time ah coming with meh lawyer friend. Always good to bring new persons into the Motorsport fraternity. However, just remember, lawyers are most useful in court. Police do not take kindly to those who are knowledgable about the law. Should be a fun day. Guardian General Insurance Limited is no longer willing to cover CARS events. A decade+ of premiums being paid with no claims suddenly seems too risky. Another company is willing but can do the paperwork next week. A cover note for Sunday is being sought. As is the driving school portion still stands. Cover note will allow for practical part of it. Last edited by CARSTT SoloDex on January 31st, 2014, 3:27 pm, edited 1 time in total. anyone can run a football tournament without concacaf intervention or taxation. Replace with any other sport / game and their "supposed" managing body. WTF makes motorsport so different? Or is this the new model for all sports under this present administration? Page three from those pictures have nothing to do with fish. It seems like this applies to certain other members of the motorsport fraternity as well. Insurance received. so consider all above an FYI, as to what's taking place. A recommend stipulation is to not use helmets since it's not a competition. 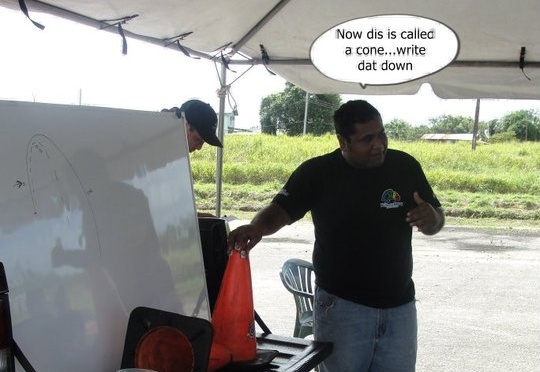 So there will be no helmet rentals nor requirement for this driving school since it is not a time trial competition, which may attract the ire of the TTPS Northern Division. Ironically, it is not illegal to drive a vehicle anywhere in Trinidad & Tobago without a helmet. Today 31st Jan, I have spent the entire day supporting the TTPS in their initiatives on Road Safety as they launched the IRoadsafe program in the South at Harris Promenade. Once available, depending on their involvement at the many big parties on Friday and Saturday night, the TTPS will also be in attendance at Sunday’s CARS BYCC to talk about their plans for Road Safety for 2014 and will be doing bretahalayzer testing. Who was the insurance received from? If the above is true I think I'll be switching insurance this year. Maybe even get my company to switch from ggil as well. AutoSport wrote: Today 31st Jan, I have spent the entire day supporting the TTPS in their initiatives on Road Safety as they launched the IRoadsafe program in the South at Harris Promenade. It must have been a hard pill to swallow earlier this month Rawle...esp' as you have been working so closely with the TTPS, for the past (umpteen years)...very few know as much about road safety as you do....so it must have been sour-sweet to work alongside a "force" that isn't always "up to par" or "even handed".....all of the time. After today, I have new respect for the "power of a phone call". But perseverance almost always bears fruit...even if it seems you are pushing a car with all the wheels flattened and the park engaged. And the worst part is those you expect to push with you, when you look around they standing up looking in the next direction. I indicated to the seniors that up to yesterday another TTPS not-so-smart-one made a fool of himself in St. James. And that will lead to even another new initiative. I was advised that this exemption only applies in built-up areas where they may need to make a quick exit from the vehicle. On the highway and in instances of a chase, they must wear seat belts . Will make it known after the event, and from word around it's not you alone interested in making that switch. just logged in in quite a while and saw this. My son like the sport and i just want to find out what fees do i have to pay to come watch? We would just be spectators. ^^ There is no gate charge. Cool ent? No excuse to not come & full up d place! free you all serious !!! will be there to support with some younger ones and some south pple to full up d place.thanks for d info. ...at work til 1:30, then is straight up to dex...allyuh wait for me! DEVI wrote: :D ...at work til 1:30, then is straight up to dex...allyuh wait for me! No! Go in the nex car park! lol lol...u want me to kneel in the naughty corner too?? ?